Amazons, we’ve had a tough week in NYC, but rest assured that Randi, Dar, and I are doing just fine. I flew back to NYC from a gig in Annapolis just as everything was shutting down. I dropped my bags in my apartment and ran to the store to see what was left. No one knew how bad things would get or for how long and I had to do my regular post-trip kitchen re-stock as well, so I was looking for things that I could cook without electricity (I’m lucky to have a gas stove) and would sustain me and any hungry neighbors for a while. I grabbed onions and potatoes, there were a few packages of celery and baby carrots left. When I got to the nearly empty meat case, I snagged the last chicken, a chuck roast, and a couple of pork tenderloins. True to Upper West Side form, there wasn’t a drop of organic milk to be found, so regular whole milk it was. The bread aisle had been ravaged, but that’s ok, because I’m trying to avoid bread anyway. In the checkout, I did spy a woman with cake frosting and a hairbrush. Hope she had a fun hurricane! I also swung by the liquor store to grab some cheap red wine; the chuck roast had given me ideas. When dealing with cheaper, tougher cuts of meat like chuck, brisket, round, and shank, low and slow is the best approach. Normally I like to cook something like a pot roast in my CrockPot, but it’s absolutely possible to do it in the oven, keeping in line with the possibility of no electricity. I was lucky enough to maintain power throughout the storm, so that’s how I’ll describe the process here. 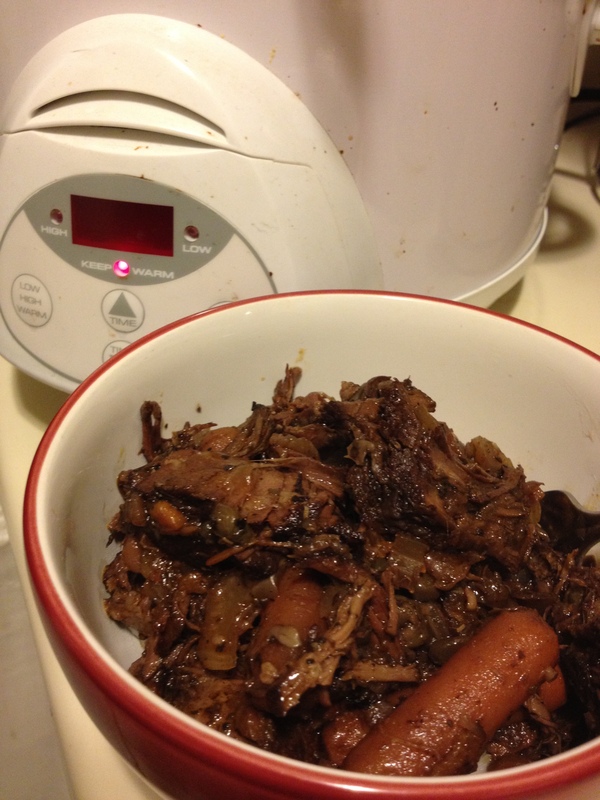 A word about CrockPots or slow cookers: They are cheap and easy and the perfect tool for when you want to come home to a delicious, hot meal after a day of work. I understand the instinct to be afraid of leaving an appliance plugged in all day in your absence, but I assure you, as long as you leave it on a hard, flat surface, leaving the crock pot working is little more dangerous than leaving a fan going. Let’s talk mirepoix. 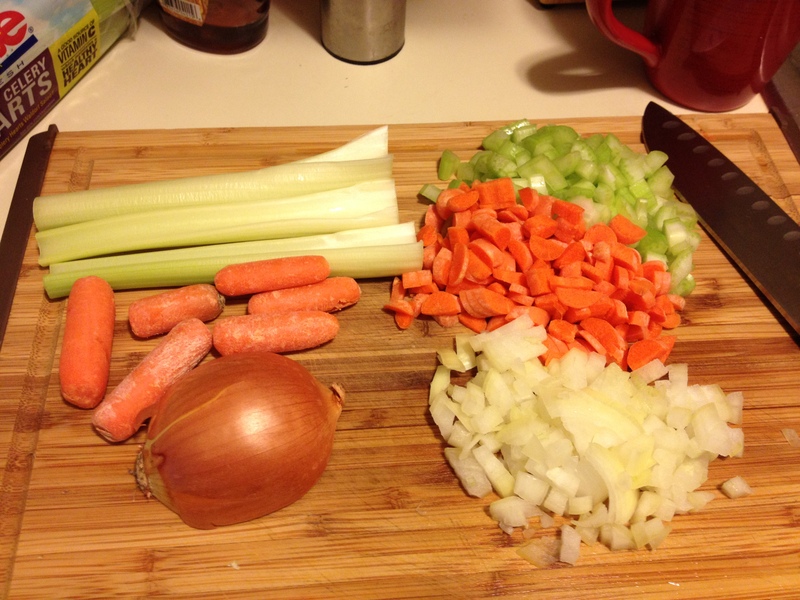 Mirepoix is a classic French culinary base for most soups, stews, sauces, etc. It’s very fancy. So fancy that it’s a pile of chopped up onions, carrots, and celery. It’ll make your life easier if you just do all the chopping in advance and set the veggies to the side. Put your large skillet on high heat and get it really hot. Season both sides of your chuck roast with salt and pepper. Put just a drizzle of oil in the hot pan, then use your tongs to place the roast in the pan. Leave it there for at least 2 minutes. Don’t move it around. Don’t check it. Don’t fuss with it. What you’re doing now is searing the meat. 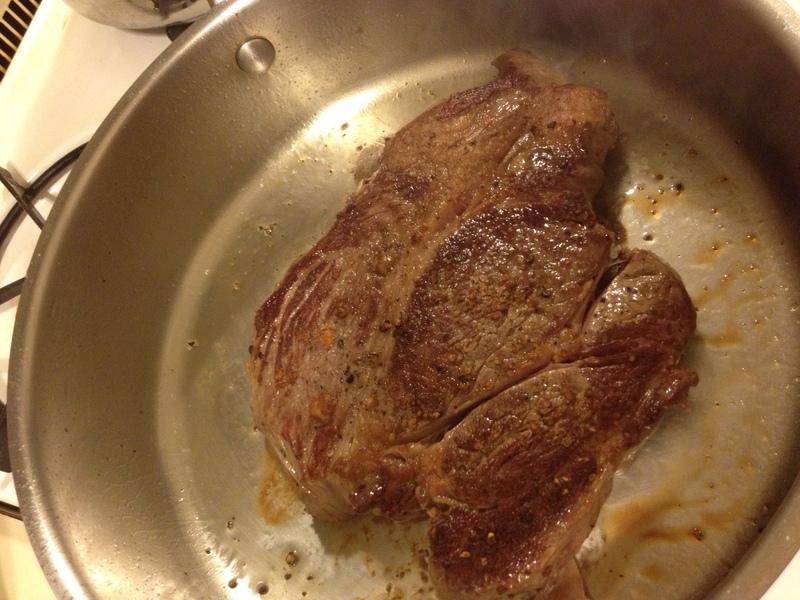 Contrary to common folklore, searing does not “seal in juices.” It does, however, put a nice caramelization on the meat, bringing out flavor and lessening its potential to look unappetizingly grey after low, slow cooking. After at least 2 minutes on either side in the pan, move it to your slow cooker. Once the veggies are soft, hit the pan with some red wine to deglaze it. All the tasty brown bits that are stuck to the pan will dissolve into the liquid, allowing you to keep all their flavor. I probably added a cup and a half of wine to my pan and allowed it to simmer for 10 minutes. I also added the tomato paste at this point. After letting my meaty, herby, winey concoction mingle for a while, I dumped it unceremoniously over the top of my seared chuck roast, threw in a few extra baby carrots, some larger chunks of celery, popped the lid on and set it on low for 6 hours. From that point on, I was a free agent. It was all bouncy cats, all the time! We don’t need no stinkin’ knives! With something this stew-like and saucy, you’re going to want something to soak it up. For some of you that might be a nice crusty loaf of bread or some bowtie pasta, but for a lot of my audience, I know that won’t quite do. For my gluten-frees, try mashed potatoes, rice, quinoa, or polenta. For my paleos I would go for smashed sweet potatoes with some salt and paprika, maybe a little garlic. Mashed, steamed cauliflower makes a nice faux potato as well. You could also just serve it over steamed broccoli. It may not get the same level of brilliant soppiness, but it’ll get you there all the same. And it’ll up your cruciferous intake to boot! If you want or need to do this in the oven instead of in a crock pot, I recommend a dutch oven or a casserole dish with a good lid, on top of an aluminum foil-lined sheet pan in the oven at 250F for 6 hours. Everything else remains the same. You’ll end up with the same product, but the electric slow cookers use a lot less energy.